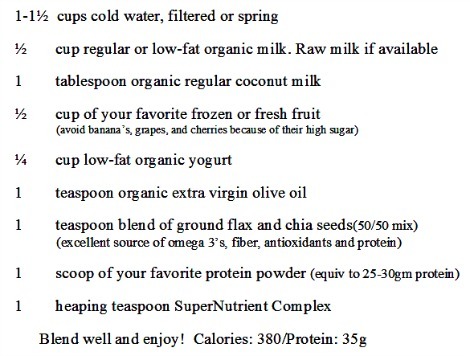 One of the best ways to manage your health and your weight is to use high nutrient protein shakes. The biggest mistake many people often make, though, is that they add lots of good protein, but don't add the all important nutrients found in vegetables and fruit, which are a key to good health. That's where the SuperNutrient Complex comes in. When you add it to your protein shake, it turns it into a high powered meal that will power your body and cells for good health. And when it comes to weight management, you will help reduce food cravings because now your body is getting what it needs. Remember, food isn't just something to simply fill the gap, but to give your body what it can use to maintain health and thwart disease and sickness. Hunger is the signal that your body needs something. And it's not asking for a Big Mac! It needs high quality nutrition to fuel the thousands of processes that go on in your body every second of every day. The SuperNutrient Complex is filled with the best of the best superfoods that are in a class of their own. When you take the SuperNutrient Complex every day, you can't help but improve your health both inside and out. With 32 superfoods and support nutrients in a proprietary alkalizing formula, it is packed with health promoting and anti-aging antioxidants, vitamins, minerals, enzymes, fiber, nutritional co-factors and trace nutrients. While they are good anytime, a properly built protein shake is a great way to 'break the fast' for your first meal of the day. It starts your day off right with what you need for sustained energy and building health. It also gives your body a break from digestion. Most people don't realize just how much energy it takes to digest food. But when you have a highly nutritious meal that has what your body needs in liquid form, it can focus more on repair and maintenance and building strong healthy cells to fight disease instead of digesting food. Plus, you get the nutrients delivered to your cells almost immediately. No waiting around. Protein shakes are also great for weight loss. Cravings can sabotage your best intentions. But when you're eating nutritionally, you will not crave as much. You also know exactly how many calories you are taking in, a key to losing weight. If you plan to effectively lose weight, you have to know what you are eating! 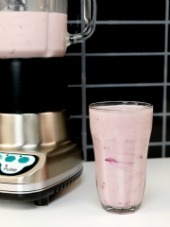 Here is my favorite blender protein shake recipe that is so loaded with nutrients, I challenge you to get a more nutritious meal. It tastes great and your body's going to love it! You'll have lots of energy and you won't feel hungry again for hours! Drink anytime.